Star Wars Battlefront, the DICE developed game based on the Star Wars franchise released last year on consoles and PC, is going to receive more additional content in the next few months. We currently don’t know much about the matter, but a new video that has surfaced online recently has shown some of the content that might be added to the game in the near future. A new Star Wars Battlefront shared by YouTube user Uninspired Zebra showcases the Ion Neutralizer star card, which differs from the Ion Disruptor as the unannounced card affects vehicles. You can check out the video right below. Last week, another Star Wars Battlefront video revealing unannounced content that might be made available soon has surfaced online. The video features unused audio files that seem to hint at a new Extraction game mode that will be different from the one added by the first DLC pack released for the game, the Outer Rim DLC pack. The Outer Rim DLC pack is the first DLC pack released for Star Wars Battlefront. The pack includes two new heroes, Greedo and Nien Numb, new maps, an increased level cap, new weapons like the Relby V-10 rifle and the DT-12 Blaster Pistol, and three new Star Cards called Scatter Gun, Dioxis Grenade and Adrenaline Stim. The Outer Rim DLC pack is now available for purchase for all users on all platforms. If you want to check out the new weapons without purchasing the Outer Rim DLC, it’s possible to do so by playing the game in single player more. 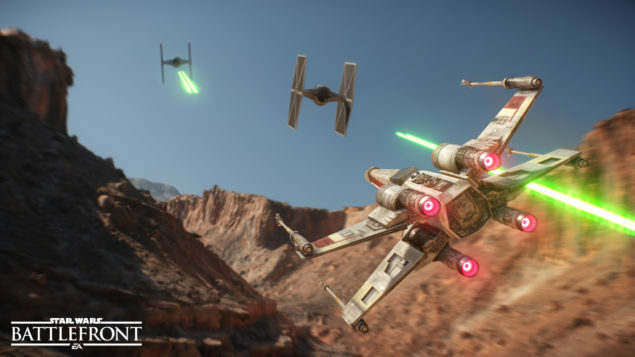 Star Wars Battlefront is now available in all regions on PC, PlayStation 4 and Xbox One in all regions. The Outer Rim DLC pack is also available for purchase right now on all formats and in all regions.